Welcome to the Tank Time TankAlong Time to get Tanked! You've discovered the home of the Tank Time TankAlong for Spring/Summer 2004. 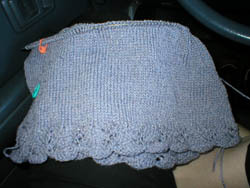 Knit a tank top of any design between April 14 and September 6, 2004. Join by emailing the Hostess with pattern name, pattern source, yarn details and link to your blog (if you have one). This space will be host to photos, links to patterns and yarns being used and keep a running list of who's working on what. Prizes to be announced at a later date. Honeymoon Cami: Knitty, GGH Mystik, mauve. Elderflower: Rowan Summer Tweed Collection, Lion Brand Cotton Ease. Frida: HelloKnitty.com, Cascade Fixation, Kool Ade Red. Drop Stitch Tank: Lion Brand pattern. Lion Brand Microspun, Color TBD. Shapely Tank: Solare by Mondial. Tank of her own design: TLC Cotton Plus. Trestle from ChicKnits: Katia Spray -100% Cotton Tape. ChicKnits ChicKami: Lion Brand Cotton Ease in Ice Blue. Just completed Chevron Rib Tank: Interweave Knits free pattern. Next tank TBA. Basic Shell: Knitting Pure & Simple, Berroco Cotton Twist. Tank of her own design. Worsted weight cotton DK on size 6 needles. uCan2: ChicKnits, Mission Falls Cotton, Maize. Bay Tank: Mission Falls Simple (Spring 2001), Mission Falls 1824 Cotton. 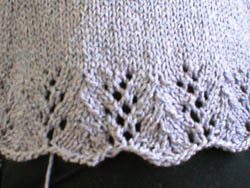 Cable Edge Tank: Classic Elite leaflet #891, Elsebeth Lavold's Silky Wool. Spring Fling Tank from the Blue Blog: Berrocco Plush #1930, Pale Mint. Cynthia from Hot Knits by Melissa Leapman: Angora blend yarn from International Assoc. of German Angora Rabbit Breeders (IAGARB). Honeymoon Tank: Knitty. FINISHED! Beginning second one for co-worker. VEVV Tank: Vogue Knitting Spring/Summer 2004, KFI Intermezzo Chunky, Green #3. Giotto Tank: Vogue Knitting Summer 2004. Shapely Tank: White Lies Designs, Endless Summer Sonata Print (aqua, purple, white) FINISHED! and Lion Brand Microspun in Mango. Ribbed Tank: Basically Brilliant Knits, Schoeller Stahl "Cecil" (chunky cotton/acrylic from Elann). Summer in the City Tank: The Yarn Girls' Guide to Simple Knits, Sonata Mercerized Cotton combined with Classic Elite Fame (rayon/silk) in Sea. FINISHED! "Goddess" Tank: Vogue Knitting cover pattern, Lion Brand Microspun, Lilac. Maude Tank: Mission Falls. FINISHED! Smooch: Cotton Classic. Boat Neck Tank from ChicKnits: Lion Brand MicroSpun in Purple. Pia: Rowan 35, All Seasons Cotton, Fern. Chevron Tank: Free IK pattern, Blue Sky Alpaca Organic Cotton, Bone. Daring Tank: (Julia's variation on Libby Chase's variation on) the Knitting Protty Tank, All Seasons Cotton, Shade 165, True Blue. Finola: Berroco Basics Tanks and Shells pamphlet #200, Berroco Zen Colors, Variegated Pink. Checkerboard Shell by Ann Norling: Endless Summer Cotton. CheesyLove Tank: Knitty, Winter 02. Handspun silk @ 25 wpi (roughly heavy weight laceweight), doubled. Honeymoon Cami: Knitty Spring '04 designed by Julia. Berroco Cotton Twist. Sleeveless Top, Reynolds 82053: Reynolds Cabana, shade 973. Honeymoon Cami from Knitty: Dalegarn Svale in fuschia. Two-Tone Halter: Hollywood Knits, Katia Mississippi. FINISHED! Her own design in Katia Idea Jeans (ribbon). ChicKami: ChicKnits, Rowan Cotton Glace #807, Spice. Victoria Lace Tank from IK Summer 04: Reynolds Irish Linen Yarn in Lavender. Spring Fling Tank: available here, for sister in Patons Fresco, Very Berry; for self in Patons Fresco, Tie Dye. Sigma Tank: Knitty, Cream & Sugar, Sage Meadow. Also knitting Shapely Tank: White Lies Designs in Cranberry for the Shapely Tank Knitalong. V-Neck Tank from Trendy Knit Tops: Bernat Denim Style in Weathered Rose. Shapely Tank: Filatura Di Crosa, Elena. Pink #7. ChicKami: ChicKnits, striped in Cotton-Ease. Shell: Vogue Knitting Spring/Summer 2000, Sky Blue Spotlight from Classic Elite. Tank Top #449: Gedifra Highlights 031, Patons Grace in white. Doris from Berrocco in Black. Camisole based on an Ann Norling pattern in Evita, peach. Finished tank in Karabella Softic in Teal Blue. Goddess Tank from Vogue Knitting in TLC Cotton Plus in deep red. Summer Funnel Sleeveless Top: The Girl from Auntie in Lion Brand Cotton Ease, Licorice. Tank of her own design finished: Manos Stria in Bubble Gum. Filatura di Crosa tank: FdC Giardino and Brilla yarns. Her own pattern: Endless Summer Cotton Sonata in Summer Meadow. Irene: Berroco free pattern. Yarn TBA, probably cotton in a funky color like lime or hot pink. Amber: Rowan Summer Tweed Collection, Shade 536 Torrid - Finished! ; "Goddess" Tank: Vogue Knitting cover pattern, Rowan Calmer, Shade 476 Coral. Custom pattern from Knitware Sweater Design at Art Fibers, Art Fibers Venus in hot pink. Boat Neck Shell: ChicKnits, Patons Cotton Top, Shade 6446, Turquoise. Checkerboard Shell: Ann Norling. Sonata 100% Cotton, African Violet. Eros Tank: modified from the Dress pattern from Plymouth Yarn Design Studio, Eros. Fiber Trends Basic Tank: Classic Elite Flash in Clementine. Tank of her own design: Patons Grace. Vera: Mission Falls In Living Color book, Mission Falls 1824 Cotton. ChicKami with wide straps: Intermezzo Mercerized Cotton in Sky Blue. ChicKami: Rowan Cotton Glace in Pear for body, Candy Floss for edging. Goddess Tank: Vogue Knitting cover pattern. Cascade Pima Tencel. FINISHED! Batz Sleeveless Top from Plassard's summer pattern book. Plassard Mayotte in hot pink and Plassard P'tite Fleur in pinks/oranges. Plymouth Yarns Eros Camisole Tank: Two balls Eros, 1 ball Wildflower DK. MaddindNalDaf on Buttons and Banners! KekVexpaifepe on Buttons and Banners! GuadodaQuox on Buttons and Banners! flefterty on Buttons and Banners! ionitough on Buttons and Banners! ReseeDres on Buttons and Banners! Futdrocachard on Buttons and Banners! saibrepablins on Buttons and Banners! Hoobezolf on Buttons and Banners! edgenofeape on Buttons and Banners! Chickami is done ! red and not as tight as i'd like , but we'll see what happends after blocking! Hi , I am on the decrease rows of the chickami on the bottom , working my way up ! ..It is fun , i had to look up a few things before venturing to this section...having a ball! I have finally started the Chickami ! It is red hot cotton ,100% cotton ......( I am a tad worried about shrinkage though ) I love it and am so glad to finally have time at night to knit this up.....YaY! Finally the TankAlonger list is updated. We have over 70 people! Holy smokes! Please check your listing and make sure it's up to date. If not, send me your updated info ASAP so we can get it all in the right shape. Anyone have pictures, news on their tanks to share? June was a whirl. My personal life has been crazy, what with a new job, my sister in town for 2 and a half weeks and crazy personal relationship stuff. The result has been Tank Along neglect. I have at least a dozen people to add, updates to make and photos to post. Hopefully that will all happen by the end of next week. I appreciate your patience and understanding. And Goddess will be finished soon! Finally had a chance to update the TankAlonger list. There are more updates to be done. Hopefully by the weekend. Anyone up for a roll call? There are at least three new tankalongers and I have yet to get their information up. I apologize. Work life spun out of control last night and I'm still trying to catch up. I'm leaving tomorrow morning for a week on Cape Cod attending a workshop. Updates may have to wait until my return. Happy knitting! Here's progress on Holly's Honeymoon Tank. help you can give is appreciated! I'll take a stab at answering since I'm coming up on a binary ribbon project and have had the same experience. 1. Working from a ball of ribbon yarn is a disaster. Out and out. Instead, I've done what Art Fibers does with all their yarns, wound it on a cylinder. Theirs are a cushy foam. At home when I have nothing quite so fancy, I use a cardboard toilet paper roll. This insures that the ribbon lies flat and feeds without twisting. 2. Instead of leaving the roll loose on your lap or beside you, get a standing toilet paper stand. One of those holders that doesn't attach to the wall but is freestanding. You can then put the roll on the stand and you don't have to worry about it rolling around getting tangled and the like. 3. If you're working back and forth rather than in the round, turn your work alternately clockwise and then counterclockwise (or vice versa), so that you don't end up with spiral twists in your yarn. For example, on finishing a knit row, always turn the work clockwise, on a purl row always turn counterclockwise. Hope that helps a little. Other suggestions? Leave them in the comments.